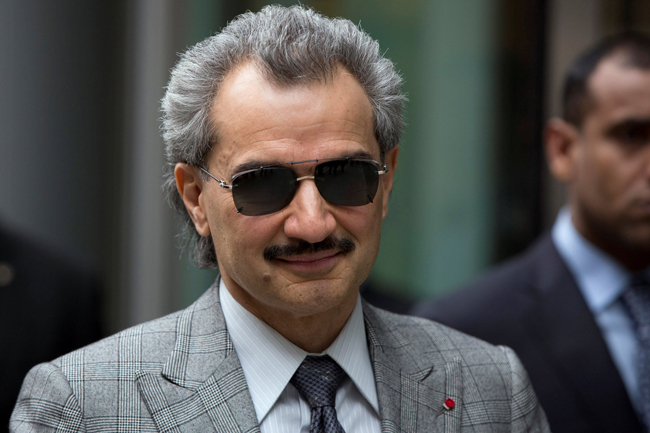 Saudi Prince Al Waleed Bin Talal has been freed by Saudi Authorities after a financial settlement was approved by the state prosecutor, an official said. Prince Al Waleed was held in November along with other princes, officials and businessmen by a new anti-corruption body headed by the Saudi crown prince Mohammed bin Salman, who tries to consolidate his power grab. Al Waleed was detained in the Ritz Carlton Hotel in Riyadh in an anti-corruption purge with the National Guard minister and senior member of the Royal family Mutaib bin Abdullah who was arrested as well as his brother Turki. Prince Alwaleed is the most high-profile detainee to have been released so far. Speaking to Reuters Saturday before his release, he said that no charges had been laid against him and expressed support for Crown Prince Mohammed bin Salman. He told Reuters he expected to be released soon. “There are no charges. There are just some discussions between me and the government,” he said in the interview, conducted shortly after midnight. “I believe we are on the verge of finishing everything within days. Few hours later, Prince Alwaleed was released. Written by: Jaber Ali on January 28, 2018. Posted by Jaber Ali on Jan 28 2018. Filed under Gulf News, Headlines. You can follow any responses to this entry through the RSS 2.0. Both comments and pings are currently closed.